Following their first visit to the Forum last year, the West Yorkshire Savoyards are returning in 2019 with a performance of the Pirates of Penzance. 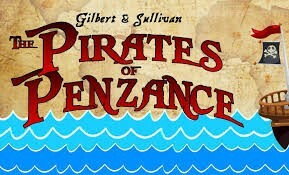 This is one of the most popular Gilbert and Sullivan operas, with a gang of incompetent Cornish pirates coming up against a bunch of even more incompetent policemen. Lots of great music, and Alistair Donkins production guarantees a load of laughs. This year the performers will be accompanied by a full, eleven piece orchestra.